By their nature Cafe Racers don’t lend themselves well to big guys. They can can make you feel cramped at the best of times and if you’re over 6 ft then it can become uncomfortable very quickly. Here I look at the options for those bigger guys who have their heart set on a Cafe Racer. 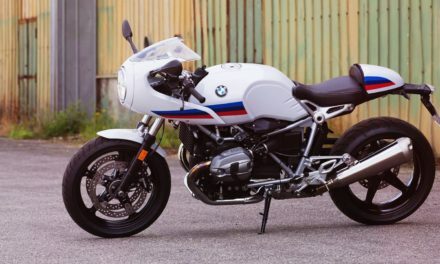 Which is the best cafe Racer for big Guys? 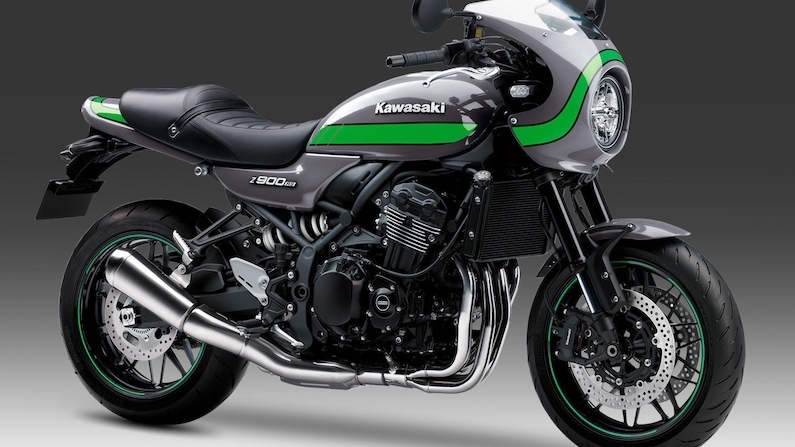 The Kawasaki Z900R Cafe has a seat height of 820mm, a wheelbase of 1470mm and a total length of 2100mm making it the biggest Cafe Racer in production. With a seat height of 829mm, wheelbase of 1500mm and a total length of 2175mm the Yamaha XJR1300 Racer was the largest but ceased production in 2016. They are still readily available on the second hand market though. I’ve listed the sizes of most of the popular production Cafe Racers below. As you will see the seat height and wheelbase can differ considerably. 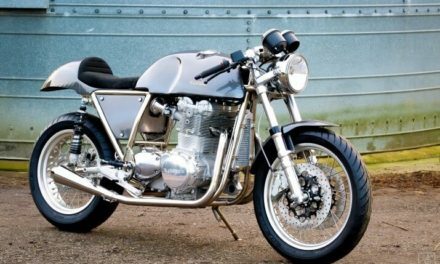 The following Cafe Racers would be considered too small for a big guy. To relate the seat heights given above to your particular body type use the measurement between your crotch and ground, AKA your inseam measurement. Remember though that the measurement that lets you actually get your feet on the ground when sitting on the motorcycle will depend on the width of the seat. Manufacturers may use a wider seat (especially triple or 4 cylinder machines) to force your thighs wider. This in turn means it’s harder to get your feet down due to the shape your legs are forced into as they wrap around the seat. The best option is to use this guide to draw up your shortlist of potential Cafe Racers and then go to your local dealers and have a sit on them to see how they feel. Peg height can also throw a spanner in the works. You find a Cafe Racer with a seat height suitable for a tall guy only to find that the peg positions are forward and your knees are tucked under your chin! Here’s what I would do if I were 6’5″ and desperate for a Cafe Racer. Get on a standard Yamaha XSR900 and make sure it’s a good fit. It’s one of the bigger motorcycles so should be fine. Assuming you find it suitable you can purchase new for £8899 or a low mileage second hand for around £5500 to £6000. The next thing is to customise it yourself by transforming your standard XSR900 into a Cafe Racer ideal for someone your height. Yamaha themselves sell a range of accessories for the XSR900 including different seats, seat cowl, rear sets etc. The rear sets in particular are ideal for the tall rider as they have loads of adjustability. There are a host of companies selling aftermarket handlebars and risers too. This means you should be able to mess around with both your leg and arm positioning ensuring you finish up with something resembling a comfortable position. Its worth noting that most riders find the Cafe Racer position uncomfortable regardless of size. When I had an afternoon on the R nine T Racer my wrists were killing for a couple of days! Building your own cafe racer from a suitable donor bike is another option you might want to consider. A self build (or having someone build it for you) would ensure you end up with a Cafe Racer ideal for a tall rider. 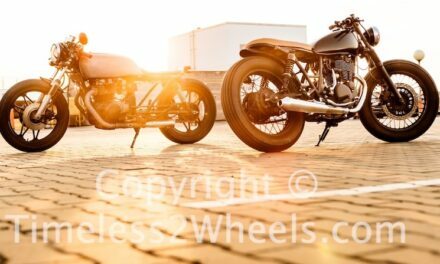 How much does it cost to build a Cafe Racer? Not as much as you would think. Particularly if you pick your donor carefully. There are full kits available for the more popular donors and you should be able to convert it yourself for no more than £1k. For a big guy wanting to build a cafe racer you want any of the late 70’s to early 80’s superbikes as your donor. Something like a Honda CB900 or 1100F Supersports or a Kawasaki Z1R or GPZ900 would be ideal. These motorcycles are big machines and make great Cafe Racer conversions for the tall rider. You will need to sit on your potential donor motorcycle. Don’t be put off if it’s not a perfect fit as you will be able to make final adjustments with peg and seat positioning. What if I’m just too big even for the XJR1300 Racer and I don’t have the skills or time to build my own Cafe Racer? If you are too tall for a Cafe Racer then consider a Scrambler or a Flat Tracker. To be honest the lines between these and Cafe Racers are blurring in the custom scene anyway. Anything advertised on Ebay that’s even slightly customised gets listed as a Bobber/Scrambler/Cafe racer. I followed your advice and got the Z900R Cafe so why do I still feel like I need more room? A brief history of the Cafe Racer movement – There’s a reason the cafe racer movement was built around racing your custom motorcycle against a song on the cafe jukebox – It was because any longer was bloody uncomfortable. If you want a comfortable motorcycle you really should consider something other than a Cafe Racer. Have I missed a Cafe Racer suitable for a big rider? Please let me know in the comments below. NextWhat Is The Best Classic Motorcycle To Buy?